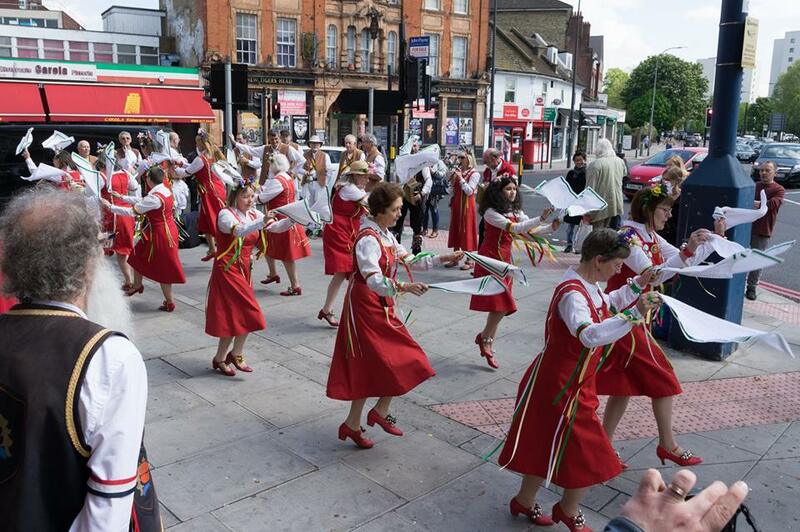 'The ancient custom of beating the bounds was observed with all due ceremony in Penge on Thursday the 26th being Ascension Day. Some 18 boys from various schools in the Hamlet, with willow wands, to which were attached ribbons and bells, started from the Vestry Hall shortly after 10 o'clock in the morning, under the direction of Mr C.W. Dommett, the vestry Clark, and Mr A. Wilson, assistant overseer, many of the vestry men being also present and joining in the procession. The party was followed by a wagonettte containing ladders etc required to surmount some of the obstacles which were encountered. At important points of the boundary the custom of "bumping" was duly observed, to the great delight of the boys, if not of some of the elders. During the journey the party availed themselves of refreshments kindly provided for them at the residences of Dr Gibbes and Messrs T. Bugler and W. Matthews. Fortunately the weather was fine, or the day would have been far from pleasant for those concerned. A number of the overseers, vestry men, and others interested in the hamlet met at the vestry Hall in the evening and partook of an excellent dinner'. Beating the bounds processions took place in many parishes until the 19th century. According to folklorist Steve Roud they involved 'walking around the boundaries of the parish both to check that there had been no encroachments or illegal building, and to make sure that everyone knew the extent of the parish in detail... In the days before accurate maps, it was essential that the knowledge of boundaries was passed on to younger generations... The participants often carried flexible wands, and when they reached a particular boundary marker they would literally beat it with their sticks. In many cases, boys were whipped with the wands at each stone, or bumped on them, or even held upside down. Sometimes they were encouraged to run on ahead to find the next marker and the first one there was rewarded. It was also thought important, even perhaps legally binding, that the whole of the boundary be followed, at least by a representative. Boys were therefore useful to scale walls, crawl through hedges, wade through ponds – wherever the official boundary took them' (Steve Roud, London Lore, 2008). Roud also mentions that Penge was 'for centuries a detached part of Battersea parish given to them in the year 957'. The parish records of St Mary's Church, Battersea, record officials 'agoeing the bownds of the parish at Penge' in 1661 and on other occasions. Beating the Bounds processions have been revived in a number of places in recent years as a way of celebrating local history and geography. In Penge, there is a Beating the Bounds walk on Sunday 4 June starting at 2.30 pm from Alexandra Nurseries, 56B Parish Lane, SE20 7LJ. In recent years there have also been Beating the Bounds processions in Nunhead, and in Lee where last month (April 22) Dacre Morris and Blackheath Morris beat the bounds of the old Dacre estate.